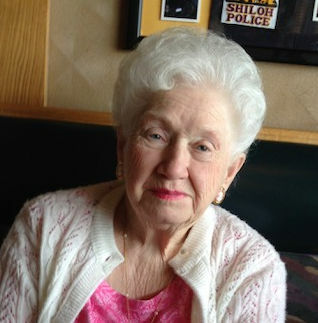 Irene A. Marquardt, nee Sabol, age 89 of Fairmont City, IL, born on June 29, 1929 in Chicago, IL, died on Tuesday, April 9, 2019 at Highland Health Care, Highland, IL. Irene was a life member of VFW Auxiliary Post #1699 in Cahokia, IL, DAV Chapter 24 in Belleville, IL and PAWV Auxiliary in Caseyville, IL. She was preceded in death by her husband, Richard J. Marquardt; her daughter, Linda Marquardt; her parents, Andy and Mary, nee Drozda, Sabol; her siblings, John Sabol and Agnes Peck; and her son-in-law, Ben Kemper. Irene is survived by her children, Rita A. Bailey of O’Fallon, IL; Helen I. (Gene) Miller of Cahokia, IL, Kathy M. (Edward) Armstrong of Fairmont City, IL, Phyllis B. Owens of Litchfield, IL, and Debbie M. Kemper of Collinsville, IL; her grandchildren, Brian (Tammy) Bailey, Mark (Christine) Bailey, Jimmy (Jessica) Riggins, Carrie Roach Marquardt (Jake Petcher), Julie (Chris) Miller Reed, and Felicia Emerson; her great-grandchildren, Richard Roach, Tori-Lee Roach, Christopher Emerson, Heaven Emerson, Brayden Emerson, Arianna Emerson, Terri McPhee, Desiree McPhee and Carlianna Bailey; her sisters Elsie Flach, Dorothy Myrda and Helen O’Guin; and her sister-in-law, Maureen Marquardt. Irene is also survived by nieces, nephews, cousins and friends. Visitation will be held on Monday, April 15, 2019 from 4:00 p.m. to 7:00 p.m. at Kassly Mortuary, Ltd., Fairview Heights, IL. Funeral Service will be held on Tuesday, April 16, 2019 at 11:00 a.m. at Kassly Mortuary, Ltd., Fairview Heights, IL. Interment at Mt. Carmel Cemetery, Belleville, IL.